On Friday, 1/26 the Varsity Basketball Team played Faith Christian in a HVAL Matchup. NYMA won 92-44 and were led by a balanced scoring attack. Brandon Evans led the team with 23 points while Zaahir Woody had 20. Mickey Urso and Zamere McKenzie contributed 10 points each while Will Mayfield scored 9 points. Josh Antoine and Karif Isaacs each had 7 points and Nigel Petti-Fernandez finished with 4. The JV Basketball Team also took on Faith Christian on 1/26 and lost by the score of 63-52. The young Knights were led by Andrew Wang who scored 17 points. Simon Chen finished with 13 points while Henri Racine added 10. Ethan Hassane also scored 8 points. On Saturday, 1/27 the Varsity Boys (9-2) played host to Carson Long Military Academy from Pennsylvania in the first ever Northeast Military Academy Tournament. NYMA won by the score of 78-48. The Knights were led by Most Outstanding Player, Zaahir Woody. Woody finished with 19 points while teammate Zamere McKenzie added 15 points. Jalen Rocks pitched in 10 while Will Mayfield finished with 9. Karif Isaacs scored 8 points, Josh Antoine had 7, Mickey Urso had 5, and David Pinto-Ricardo and Nigel Petti-Fernandez each contributed 3 points. Carson Long Military Academy’s Brandon Osofo and Tristin Garcia both scored 16 points apiece and Osofo took home the Sportsmanship Award. The JV Team also played Carson Long and won by the score of 62-34 with Cadet Andrew Weng scoring 20 points for the Knights. On Saturday, 1/27 the NYMA Wrestling Team traveled Down 9W to Storm King and wrestled against Woodhall, Marvelwood, and Storm King. Matthew Montes and Nathan Kratman wrestled very well and made NYMA proud! 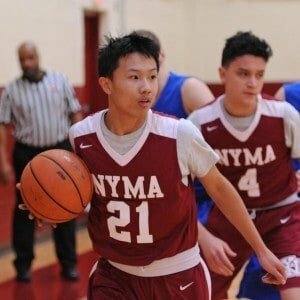 On Monday, 1/29 the NYMA Varsity Basketball Team (10-2) started a five-game road trip by traveling to Hartford, CT to play a very talented Watkinson team. The game was 39-30 at halftime in favor of NYMA. The Knights ended up winning by the score of 86-48. NYMA was led by Will Mayfield who finished with 27 points, 20 rebounds, and 6 blocks. Brandon Evans scored 21 points and Zamere McKenzie finished with 17. Zaahir Woody also had a great game contributing 9 points, 12 assists and 12 rebounds. On Wednesday the Varsity Team then traveled to Oakwood Friends and won by a score of 77-42. Senior Zaahir Woody led the Knights in scoring with 22 points. That effort helped Woody eclipse the 1,000-point total for his high school career! Brandon Evans also finished with 20 points for the Knights. Other cadets with solid contributions were Zamere McKenzie and Mickey Urso with 8 points and Karif Isaacs and Josh Antoine with 7 points. That same Wednesday the NYMA Bowling Team was in action again. Match #1 was versus Storm King. NYMA was defeated in 2 games by scores of 109-91 and 138-105. Stand out players for this match for NYMA were Mandy Wang, Heidi Welsh, and Zhengkun Yang. The second match was against Faith Christian Academy. NYMA lost the match with FCA winning game one 109-98 and NYMA winning game two 121-97. FCA came through with a clutch strike to win game three by the score of 114-107. Mandy Wang and Heidi Welsh carried the team against FCA making 5 of 6 spares that they attempted. Next week we will be at Pat Tarsio Bowling Lanes for matches that will be starting at 3:00 pm sharp! If you’re free, come by and support your Knights! On Thursday the Varsity Basketball Team headed up the thruway to New Lebanon to take on Darrow in another HVAL matchup. NYMA (12-2) won by the score of 80-39 as Zaahir Woody finished with 19 points. The Knights got a solid contribution from Zamere McKenzie who finished with 16 points, Karif Isaacs who had 11 points, and Mickey Urso who scored 10. Josh Antoine and Jalen Ricks also each scored 7 points while Brandon Evans ended the game with 6.